BBC NEWS | UK | Magazine | What is relativism? Shortly before he was elected pope, Cardinal Joseph Ratzinger delivered a withering denunciation of relativism. For those unfamiliar with even the blunter points of philosophy, what was he driving at? Moral relativism is the idea that moral principles have no objective standard, so states its dictionary definition. In its extreme, the view that there are no hard and fast rules on what is right and wrong, on which values are set and should be fought for. It is in contrast to absolutism, that there is one truth. Relativism is "Different opinions, no one authority, and as many 'truths' as there are people or societies or cultures advancing different ways of doing things," says Simon Blackburn, Professor of Philosophy at Cambridge University. It is easy, he says, "to give relativism a slogan: Beauty lies in the eye of the beholder. One man's meat is another man's poison." And when that is applied to ethics, then goodness, virtue and duty also lie in the eye of the beholder. So, for the western liberal, living under western liberal influences, with western liberal opinions, he says, contraception and abortion are in, but for the Catholic Church, they are out. In his sermon ahead of the conclave to choose a new Pope, the then Cardinal Joseph Ratzinger warned of the need to preserve the Church's traditional Catholic tenets against modern trends, against the "dictatorship of relativism". Moral standards, Catholic conservatives believe, should be perfect and unchanging. At the same time, relativism was being attacked in the British general election campaign. Under it, said Michael Howard, leader of the Conservative Party, traditional British values are "being trashed" as "the victims have become the aggressors and the aggressors have become the victims"
On education, much is made of a lack of discipline in schools at a time when parents can challenge the teachers who used to be a figure of absolute authority. The arguments' theme is not new. 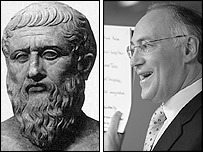 Two and a half thousand years ago, Professor Blackburn points out, Plato opposed relativism in his Dialogues when he sought "one true opinion, real knowledge, real authority" and wanted to establish the error of other opinions. In the Reformation, Martin Luther argued authority came from each believer, from the bottom up, not from the top down, as Church heads would have it. As Julian Baggini, editor of The Philosopher's Magazine, highlights, relativism grew under "early globalisation" when explorers discovered other cultures had different standards and morals, a catalyst to reconsider their own. In the late 20th Century, postmodernism had academics arguing that there is no one truth, just many interpretations. And in politics, some cast the impeachment of President Clinton as an absolutist attempt to establish right over wrong. But philosophers warn against painting a crude black and white contrast between one absolute truth and the rest - bagging together all "relativists". "The problem is that it's not just a contrast to absolutism," says Baggini. Relativism, he says, gets "a bad name" from opponents like the church who cast it only as "an anything goes" approach to moral questions. The reality has a much more diverse set of views, he says. That bad name, he believes, is "perhaps the biggest example of philosophical illiteracy". The biggest problem that I have with these comments against Relativism is that the speaker is almost always the leader or an official of an organisation claiming to be the "one truth and morality". They are in effect simply telling the listener to obey them. An absolutist stance to morality is too simplistic. For example, there is a world of difference in intent between the taking of life as an act of murder and the taking of life as an act of mercy. That is why absolutism ends up as moral fascism. The Pope is absolutely right. It's time to jettison the nonsense of moral relativism which emerged in the social upheaval of the 1960s and has been responsible for the modern disfunctional society we now have. You cannot have half-rights and half-wrongs; there is only right and wrong and we must face up to that truth even if it makes some people uncomfortable. The belief that there is only one moral truth and that you are following the only one moral truth is the source of all bigotry and hatred, in religion, politics and elsewhere. It allows you to demonise others as evil, refuse to see their point of view and refuse to accept that moral standpoints are based in culture and change alongside it. I actually believe relativism is a positive thing. What exactly is the basis for moral absolutes? How does one know they exist? What morals in themselves are absolute? Moral relativism can be seen in everyday life anyhow. Some think it's wrong to eat meat. Personally, I don't believe it is. The Ancient Greeks practiced slavery and believed in was an acceptable institution. Contemporary Europeans do not. 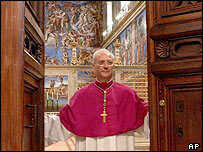 The Catholic church relies on revelation as the source of truth. It has been proved wrong before (Galileo) and be may so again. For it to deride people questioning and attempting to find truth via other means sticks in my throat. That said, there does appear to be a great deal of philosophical vacuity in the modern world at the moment. If the church means to correct this by reasoned philosophical discussion then it is laudable. No-one believes 100% in relativism. None of us live 100% by absolutes. Society changes, it has to to survive. This, by definition, means that all societies that want to prosper over long periods of time are 'relative'. If you lived in an 'absolute' world, we would still believe slavery was fine, that monarchs were divine beings and we should never leave our place. One major flaw with moral objectivity which relativism addresses is the ability to react to modern moral dilemmas. Traditional absolutist ideas are silent on issues such as cloning, stem cell research and separation of conjoined twins. Relativism does not equal moral dissolution: it merely recognises the blatant fact that there is a plurality of beliefs. The pluralism of democratic Western liberal societies, for which we should all be deeply grateful, would not be possible without the concept of relativism. "Moral standards, Catholic conservatives believe, should be perfect and unchanging." Really? Can we expect the return of thumbscrews, the rack, and public burnings for heretics and moral relativists? I think relativism is a danger, and it is fantastic that both Howard and Pope Benedict 16th recognise this. It destroys moral values, leading to the argument "what are morals?" Under such philosophy, if we're not careful, we may see murderers walk away because they have found a way to justify there crime using relativism. Extreme I know, but possible one day if we're not careful. It's worth pointing out that moral relativism is in itself an absolutist moral stance as it states that no one moral system has the right to impose itself over another moral system. If relativists were to be retative about this they would instead take the view that if a particular morality includes condeming another then that stance is relatively right for the moral code in question.